Listen to this eleven-minute excerpt, and don’t bother clicking unless you’ll commit to the whole thing. It’s the ending of David First’s Pipeline Witness Apologies to Dennis, and I hope the mp3 format doesn’t dumb it down too much. 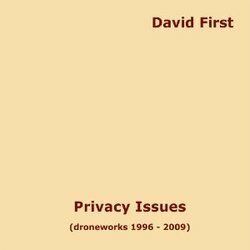 First’s new three-disc set Privacy Issues, on Phill Niblock’s XI label, is the greatest new recording I’ve heard in awhile, and I’ve been relistening to it every few days. 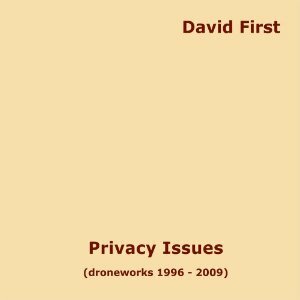 It’s all drone-based works from the last 14 years. David’s work is sometimes (amazingly) solo and sometimes ensemble; I picked an ensemble piece here thinking it might have a little more profile over computer speakers, but he can make just as much noise by himself. It’s all music gradually going in and out of tune. You could say that Niblock’s music is the same, and it is, but while Niblock’s music is slow and marvelous and creeps up on you unawares if you have the patience, David’s is considerably more dramatic and high energy. You don’t have to wait for it, it’ll come get you. He’s always been really interested in the liminal area between consonance and dissonance, and the amazing places in his music are those in which you suddenly realize where the music’s going, and you can’t believe it’s about to get there – buzzy and jangling for a long time, but then it starts to slide into tune and this gloriously consonant sonority emerges that you couldn’t imagine was in there. It really feel symphonic to me, like a symphony stripped down to just its harmony, and blurred; Carl Nielsen comes to mind, because Nielsen has these great harmonic clashes in which some major key wins out in the end, and it does in First’s music too, just far more gradually. I wore out three laptops trying to make First famous via the Village Voice, and I’m thrilled that after a long silence he’s got this incredible CD set out, every piece a knockout. I wish I could write music like this, but I can’t. I tried. I just can’t make anything work without a melody to it, but some of First’s passages almost sound like you could analyze them with Roman numerals, except for the buzzy parts in-between. If I were a young composer today this would be my Stockhausen, except that First is already older than Stockhausen was when I was a teenager. In a sane world, grad schools would be hosting conferences on this music, but everything’s so conservative these days that it’s more fringe now than it was 20 years ago. Though I’m sure there are some smaller outlets also carry it. I clicked on the link and it automatically started playing after downloading, prompting my laptop to vibrate to my delight. Its amazing how the drone both seems to be a freeing element and a constraint on the music going on around it. That was very beautiful, and not what I expected: I heard First play a solo gig at Roulette in the 90’s and that was, as I recall, more tense, with a Niblock-like close cluster of pitches. He used an e-bow, which I’d never seen before. The (digital?) electric piano is a very suitable instrument for just intonation, I think. Lovely stuff, Kyle. I wasn’t expecting it to remind me of Laurie Anderson’s UNITED STATES-era stuff, but it certainly did. Thanks for the heads-up! Thanks for this Kyle! Honestly, I’m not generally a big fan of drone-based music, though there are of course many exceptions. This is a definite exception… wonderful stuff! For the first 45 seconds or so, I thought, “ick, I don’t like this at all,” and then about 2 minutes later I was completely hooked. Always thankful for new sounds in my ears. Very cool. Listening through my laptop speakers, I thought I could feel the air pressure change as the notes were moving in and out of tune, like a change in altitude. That’s probably not what was happening, but that’s what it felt like. Like a liftoff. You know, Kyle, the academic silence on music like this reminds me of the silence of theorists on music of the Middle Ages and the Renaissance. Very little said. “Like we’re scared to death of it,” a theorist once said to me. The simpler and more intuitive the structure maybe becomes harder to talk about intelligently. Pop and folk have lyrics to hold on to. I bought a copy because of this review!